Lorraine Hazel, M.A. CCC-SLP is your Independent Certified Instructor and On The Grow Educator for the Coachella Valley. Education and Experience: Lorraine is an Independent Certified Instructor with the Baby Signs® program. She is a Speech Language Pathologist and has worked with children in the school setting for 30 years. 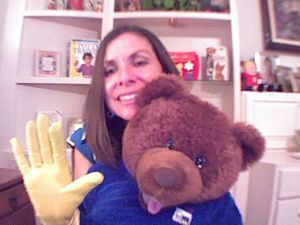 She holds a masters degree in Communicative Disorders from California State University, Fullerton and Clinical Rehabilititative Services and Elementary Multiple Subject Credentials. Lorraine began learning American Sign Language when she worked with the hearing impaired programs with Riverside County Office of Education and has used signs with language delayed hearing children to help them develop language as a Speech Language Pathologist. She started teaching signs to her youngest daughter very early on and discovered that even a two-and-a-half month old can learn to sign "more" to express her wants and needs. She found using signs with her baby such a rewarding experience that she began teaching her family and friends to use signs with their babies. After discovering the Baby Signs program, she found that it was a match! Lorraine is very passionate about teaching the Baby Signs Program and helping parents encourage language development in their children. She looks forward to hearing from you! When I was working on my graduate degree in Speech Pathology, I heard about the benefits of using sign language with language delayed children from my professors, and in my own experience, I have seen how simple signs paired with verbal language truly does enhance the acquisition of verbal skills rather than hinder it. I started using simple signs with my daughter when she was just two and a half months old. I began with the sign for "more" because her hands were still in little fists and I wanted to get them moving. I paired it with an activity she loved to do - trying to stand. Imagine my surprise when she started to use the sign on her own the very next day! This of course is not typical, however I think we tend to underestimate what our babies can understand and do. Sign language opened up a communication window for my daughter and I, and it was such a delightful experience that I started encouraging my friends and family members to use signs with their babies. My niece at one years old was able to tell her mom if she wanted cereal or milk and many other things through the use of signs. At 18 months she was able to speak in 3 word sentences! Her mother credits her well developed vocabulary and language skills to teaching her signs as an infant. I know that using signs with your baby will enhance your enjoyment of this precious time with your little one just like it has done for us, and I welcome the opportunity to share with you and your baby the joy of communication.